A Year of Being Here: Jane Piirto: "Tomorrow, Today, and Yesterday"
"Tomorrow, Today, and Yesterday" by Jane Piirto, from Saunas. © Mayapple Press, 2008. Image credit: Unknown, though it may be by E. H. Shepard, the illustrator of A. 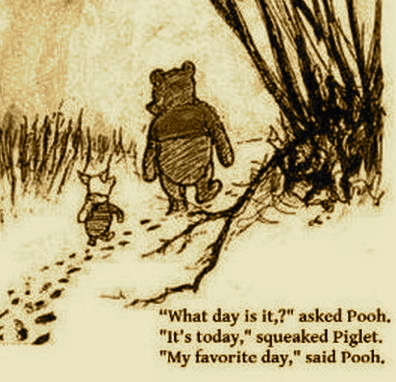 A. Milne's Pooh books (originally color).